Data and system recovery software is an essential product to keep on your shelf. Granted, you'll feel slightly aggrieved for shelling out on a piece of software that you may never use, but if you do suffer a total system crash then it can become worth hundreds of pounds - maybe even priceless to you in the struggle to rescue your sensitive data. Recovering those precious files successfully after a data disaster is one thing, but programs that'll transfer everything to a new hard drive - when upgrading to a new PC, for instance - can be hard to operate. Avanquest's Disk Copy & Clean aims to fill this role and redress the balance with ease-of-use, but in doing so it neglects the area of system recovery. Partitioning, data transfer and system recovery all go hand-in-hand, and suites such as Paragon's Hard Disk Manager offer these in one neat package that covers all the bases. 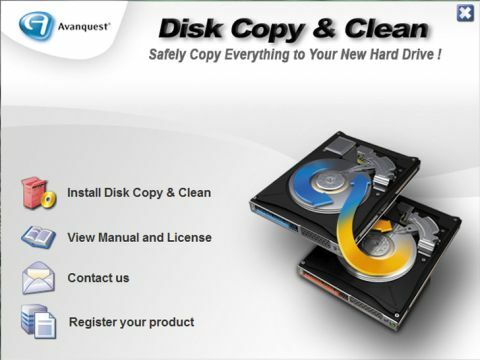 Disk Copy & Clean may not offer the value of whole system recovery suites, but as a piece of copying software it performs well and has a neat feature in its ability to expand partitions quickly to fit a new drive. We tested it on a massive terabyte drive and were impressed by the way we could restructure data on the new disk to fit it onto new partitions. Disk Copy & Clean runs off a live CD, which solves the problem of installing extra software when modifying whole drives. Disks are pre-scanned for bad sectors prior to copying, ensuring that your data is ported across and any errors are neatly avoided. The one-click copy wizard couldn't be simpler, but apart from the partition option the copying process doesn't leave much room for experienced users to tinker with advanced drive settings. At £20 you can argue that Disk Copy & Clean is money well spent. At a stroke you can transfer all your data to a new drive and not have to worry about dealing with partitions that you do or don't want. However, with complete disk management suites available for just a little more money, Disk Copy & Clean's long-term usefulness is under significant threat.